The May 2017 Trail Mix Monthly Hiking Digest is available. Long story short, it's a collection of articles written with your hiking plans in mind, plus the latest hiking news and a big dose of fun. To read more about this new way to get the latest hiking tips delivered to your in box, here's a detailed description of Trail Mix Monthly Hiking Digest. These comments about the April issue of Trail Mix were sent to Hiking For Her, with permission to share them with you. "I loved the bird on the cover, such a nice way to open up! And I love that the whole thing inspires me to get out there. "Lastly, thanks for the tips about food ... love having the knowledge to stay healthy and safe!" What's in the May 2017 issue? The May 2017 Trail Mix monthly hiking digest has 6 detailed articles on hiking topics of interest to hikers everywhere. You won't find this type of information, presented in an easy to read style, anywhere else. Because everything in this monthly hiking digest is written specifically for you. Expect lots of high quality hiking information in the May 2017 Trail Mix Monthly Hiking Digest. The May 2017 Trail Mix Monthly Hiking Digest articles are focused on making you a prepared, comfortable hiker regardless of where your hiking plans will take you this month. HFH knows these are great things to have on any hike, and can't wait to share them with one lucky winner of a random drawing. Details for how to enter for your chance to score this box of hiking goodness (approximate value $25 U.S. and mailed directly to you) are included in the Hiking Digest. Trail Mix Monthly Hiking Digest is just getting started. So the price per issue is a low $2.99 for 40+ pages of hiking goodness, written with the same detailed expertise as all of the pages on this website. But available only to you as a subscriber! It's easy to use your PayPal account for a secure transaction. The May 2017 Trail Mix Monthly Hiking Digest will be instantly available as a pdf download to your electronic device. So fast and easy to get your own copy! And here's the great thing about this trail mix - it never gets stale! Want to read about the inaugural Trail Mix issue? 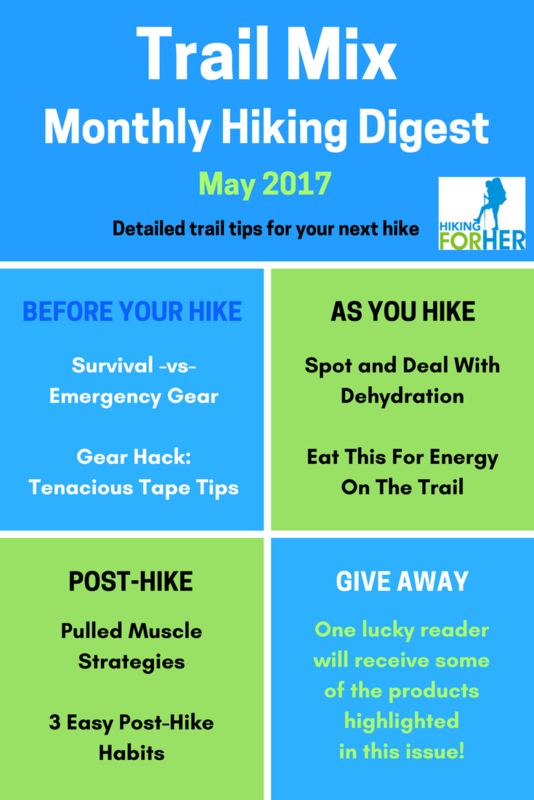 Questions about the May 2017 Trail Mix Monthly Hiking Digest? Use a different address to try again. Or double check for a typo. Why wait one second longer?? Dig into some tasty, nutritious Trail Mix right now. These tips are evergreen and useful for both men and women, to keep your hiking time satisfying and safe.